The Supreme Court issued a ruling yesterday that is disappointing for anyone concerned with civil rights. In Florida v. Harris, the Court unanimously overruled the Florida Supreme Court and held that a “dog sniff” is enough to establish probable cause for a police officer to search your vehicle. Last summer, I wrote about a case that has yet to be decided, Florida v. Jardines, that also challenges the validity of drug-sniffing dogs. The problem with drug-sniffing dogs is that they can be influenced by their human handlers, and the prejudices and preconceptions of dog handlers should not be enough to establish probable cause. The latter case could still be decided differently since the Court has traditionally been more protective of rights when a house is involved, but its decision in Harris indicates a reluctance to second guess the use of drug-sniffing dogs, despite a lack of science establishing their reliability. In this case, the dog was wrong that the defendant, Clayton Harris, had any of the narcotics that it was trained to uncover. Mr. Harris was pulled over twice, two months apart, and the same dog and handler walked around his car. Both times the dog alerted. The first time, Mr. Harris had ingredients and equipment for making methamphetamine, but the dog was not trained to find those ingredients. The second time, he had nothing illegal at all. From a civil rights perspective, the problem is that most police departments do not keep records of stops involving drug-sniffing dogs. For people who are truly innocent, this means their lives can be disrupted while an officer tears apart their car looking for the contraband that will never be found. The innocent person may or may not receive an apology from the officer, but that will be cold comfort for anyone who missed a crucial appointment or had embarrassing (but not illegal) personal belongings uncovered while the officer searched. For the guilty, it shifts the burden of proof from the prosecution to the defense. A defendant must show that the dog and the handler are unreliable, and if police departments do not keep records or a dog’s mistakes, this will be nearly impossible. 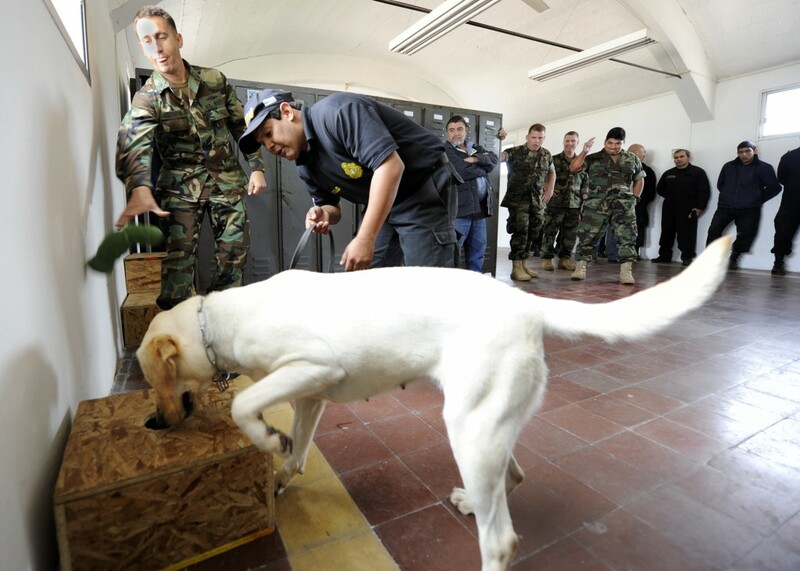 Categories: Criminal Law | Tags: drug sniffing dogs, search and seizure, Supreme Court | Permalink. This fall, the Supreme Court of the United States will hear oral arguments in a case that challenges the use of drug-sniffing dogs to perform warrantless searches outside a suspect’s house. The case, Florida v. Jardines, arose when Miami police received a tip that Joelis Jardines was growing marijuana in his home. The police took a drug-sniffing dog around the perimeter of his house, and the dog indicated that it smelled drugs. Based on that information, the police obtained a search warrant of the house, and they found marijuana plants growing inside. The Supreme Court has previously allowed drug-sniffing dogs to be used around cars or in the airport, but since that time a study from UC Davis has called into question the validity of drug-sniffing dogs. UC Davis recruited 18 law enforcement dogs with their human handlers for the study. Experimenters told the handlers that drugs or explosives might be present at the testing site, but neither one was present in any of the rooms. If the dogs had behaved appropriately, they would have passed through all four rooms without alerting their handlers. Only one of the 18 dogs did not falsely alert in any of the rooms. UC Davis researchers hypothesized that the dogs were taking cues from their handlers. If that is true, the dogs are merely relaying the preconceptions of their handlers, and it calls into question the validity of drug-sniffing dogs in any circumstance. The Supreme Court might not speak on the validity of drug-sniffing dogs when it rules on this case, but it should. It is important that police have actual evidence when they request that a search warrant from a judge; the preconceptions of dog handlers should not be enough for probable cause. Categories: Criminal Law | Tags: drug sniffing dogs, law enforcement dogs, search and seizure, Supreme Court, Utah criminal lawyer | Permalink.